It was late one summer night in 1973, a few months after graduation, when my friend Scott appeared outside my window wearing a tall beaver-skin top hat. He had just returned from a solo trip to Africa, where he had traded with a villager for the hat, because, he said, it had magic in it. We sat in the moonlight, sharing a bottle of Stolichnaya, as he told me the tale — part Joseph Conrad, part Hunter S. Thompson — of his mad adventures in Kenya. At Winter Park High School, Scott Wallace was an enigma: tall, ascetic, nearly silent in public, he was the genius kid who spent half the day at FTU because he’d exhausted all the science and math courses WPHS offered; the kid who was reading Dostoyevsky in Russian and working through the Upanishads in the original Sanskrit. His tenure as student council chaplain abruptly ended when faculty complained that too many quotes from Nietzsche and Wavy Gravy had turned up in the morning announcements. But to us, his close friends, he was a rebel visionary, the creator of wild and intricate pen-and-ink drawings that covered panel after panel of poster-board and featured fantastical figures engaged in epic struggles for other-worldly survival — a kind of techno-Hieronymus Bosch. If underground comics had a Sistine Chapel, Scott could have done its ceiling. We were in awe of his imagination and wondered often where these creatures came from. An answer, at least part of one, came soon enough. After a year at Purdue, studying engineering, Scott was on his way to Northern California to enter a Buddhist monastery when he suffered a psychotic break and the schizophrenia he had struggled with privately took hold of his life. If underground comics had a Sistine Chapel, Scott Wallace (right) could have done its ceiling. For years, he lived in the worlds he had been drawing, worlds that had become the landscapes of Hell. Scott was fortunate in that he was not abandoned. A few friends and family hung in there with him, when he’d let them, most notably his sister Julia and John Sheehan, his high-school Russian teacher who remained his mentor and confidant. 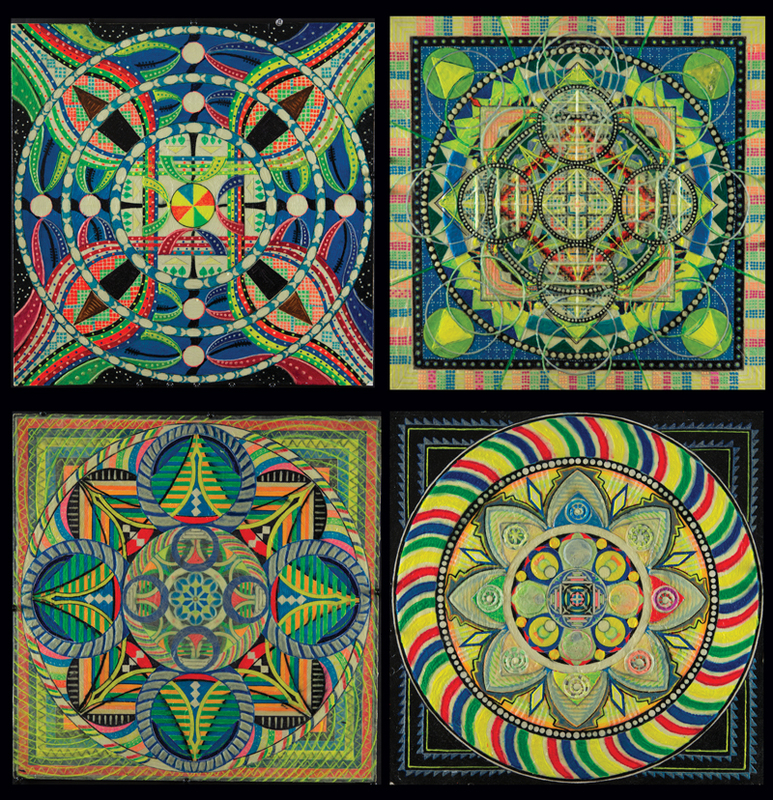 They kept encouraging Scott to draw again and eventually he did, beginning with mandalas — elaborate mystical designs that he created with a completely free hand, using no compass, tool or straight-edge. In a very short time, he was producing quiet masterpieces layered with exquisitely detailed figures working together in perfect harmony and balance. These works transported the viewer into a state of meditative wonder. I know almost nothing about art, but it seems to me that beyond the feel-good story and my personal interest in seeing a friend’s work recognized, there’s something extraordinary in what Scott has created. As Scott’s confidence grew in his work, so did his sense of his place in the world. 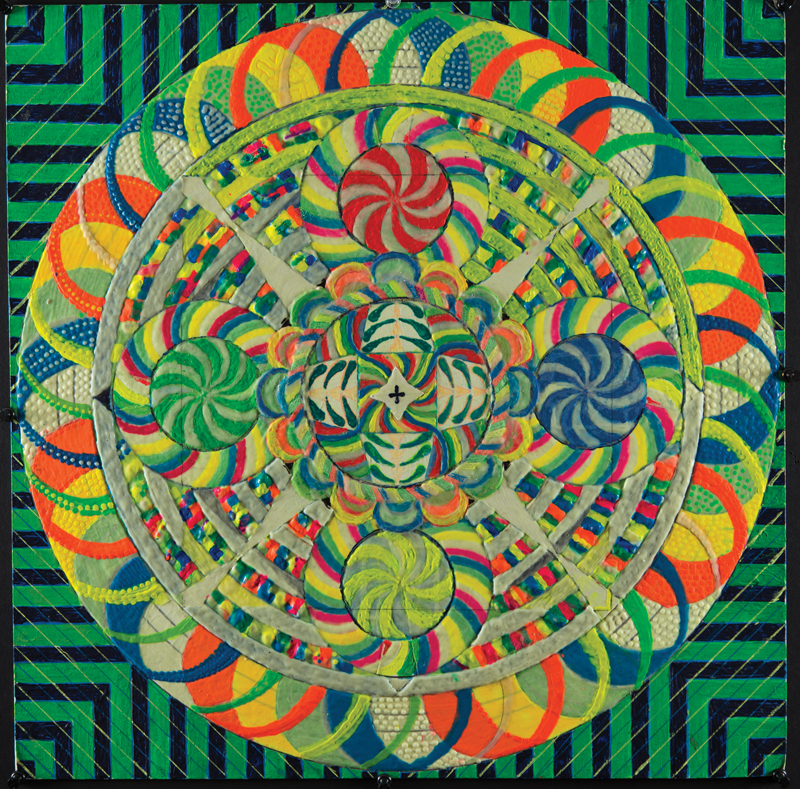 He showed his mandalas publicly at a Third Thursday exhibit at the Orlando Museum of Art; no other artist had anything remotely like them and for many, their brilliant detail and vivid color made them the hit of the show (although he refused to sell any, being willing only to part with them as gifts). More recently, Scott has been exploring surrealistic landscapes created in fluorescent paints, building fanciful mountains and trees and animals with thin layers of color. The paintings can appear crude in simple daylight, but when exposed to a black-light source new dimensions open in the work that give it an entirely new meaning and quality. Much like the artist himself, the paintings ask that you forget the surface and explore what lives beneath it, which can only be found in a different light, with a different way of seeing. Wallace’s mandalas are quiet masterpieces layered with exquisitely detailed figures working together in perfect harmony and balance. He primarily uses colored pens and pencils, and more recently has added a variety of textures to his works. The mandalas shown in this story look different when exposed to a black-light source. 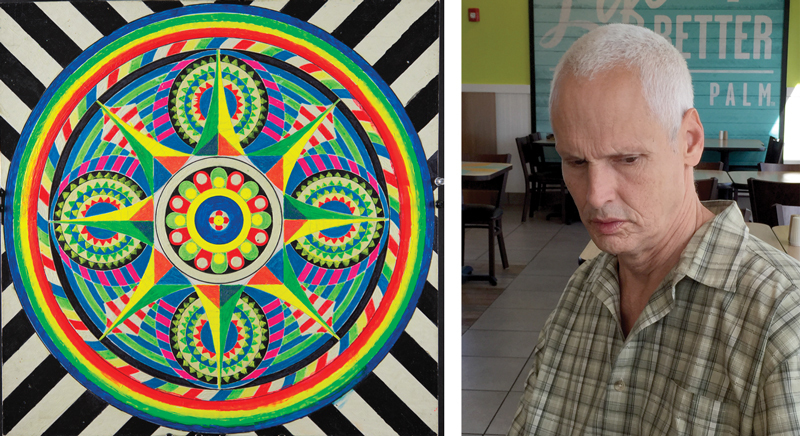 Decades later, Scott still struggles with schizophrenia, and now and then he struggles a lot. In 2014, John Sheehan passed away, taking a good part of Scott’s lifeline with him, although he seems to be painting even more now as he has withdrawn further. Like William Blake and Vincent van Gogh, Scott does not distort the world to create meaning; rather he creates meaning by depicting the world more or less as he sees it. And for all of us, there is real value in taking the time to see the world that way — through the talents of a brilliant and different mind. Tom Nowicki is a Winter Park-based actor who has appeared in numerous stage productions, television programs and theatrical films. His most recent project is Lodge 49, a series that airs on AMC.